I was keen to help my body with the process of eliminating toxins after 6 months of chemotherapy and something inspired me to try out a week of juicing. I have just completed 6 months of ABVD chemotherapy every 2 weeks and luckily it worked – the cancer has GONE! I have found very little information on ways to help the body recuperate after chemotherapy and often spas or hotels which offer retreats to help chemotherapy patients are too expensive. I didn’t want to rush into any extreme detox as I felt my body wouldn’t be too happy about such a massive, sudden change. 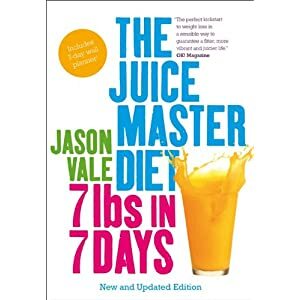 However after reading Jason Vale’s ‘Juice Master Diet, 7Lbs in 7 Days‘, I was inspired to do a week of juicing 2 weeks after my last chemo to give my body a chance to relax. My step father and I completed the 7 days plus continued on to do the 14 Days Turbo Charge Your Life as recommended by Jason. For me I tried to not make it about losing some of the 2 stone I put on during chemo but more about giving my body the opportunity to rest. I will admit I didn’t feel a huge amount of difference but I largely put this down to not being able to have done the recommended exercise plus the simple fact that my body will take its time to recuperate and return to normal. Perhaps I was expecting miracles which doesn’t surprise me after feeling so low and exhausted for 6 months but I do believe it boosted my recovery time. Now being in Ibiza, people can hardly tell I’ve been through chemotherapy apart from my hair loss. So for me doing this juicing program for a week was hugely beneficial. We now have the juicer in Ibiza and I will slowly re-start to replace a meal a day with juicing. In terms of Jason Vale and his juicing philosophies, I think he’s brilliant. After reading his book, The Juice Master Diet, I believe he has excellent intentions for the West to grasp the benefits of juicing for our tired bodies. It really opened my eyes to my own health and why its so valuable to look after our bodies. I also downloaded the APP on my iPhone which is complete with demonstrations on how to make the juices for each day. This really appealed to all of us on the program because it made it so much easier to understand how it all works! Jason also has plenty of inspiring talks on the App to get your juices flowing and inspire you to follow through with his program. I really enjoyed the detox and I know my body did too! I accompanied the detox with Oxy-Powder capsules which were recommended to me to help my gut return to a vaguely normal state after the heavy bashing it just went through! Oxy-Powder has been extremely beneficial but as with everything I have just written, its my personal experience and everyone needs to discover what works best for them! www.oxypowder.net – Everything you need to know on what oxy-powder does.